I have been using the Neutrogena Wave since I got it a couple of days back. As a techie lover of a kikay that I am, I cannot help but swoon over this trendy gadget during the launch. I so love it! Who would have thought that a gadget like this will ever be made available to the public and it is so affordable. Sure there are a handful of beauty electronics but most of them either come in really pricey or not very practical to purchase for personal use and will only be fit for beauty clinics. The derma who explained how important it is to thoroughly cleanse our face during the launch could not have said it any better. I am convinced. I saw for myself that despite the prior washing I did before using the Wave, the cleansing foam attached to the gadget still got very colored. Meaning, all the makeup and dirt did not come off with just mere washing. I also love the gentle massaging it does to my skin. Now pampering can happen right in the comfort of our own homes. The newest addition to the brand’s Deep Clean line, the Neutrogena Wave leaves an intense deep clean feeling in just three easy steps. 1. Attach a disposable foaming pad to the head of the Neutrogena Deep Clean Wave power-cleanser. 2. Hold the gadget under running water to activate the cleansing pad. 3. 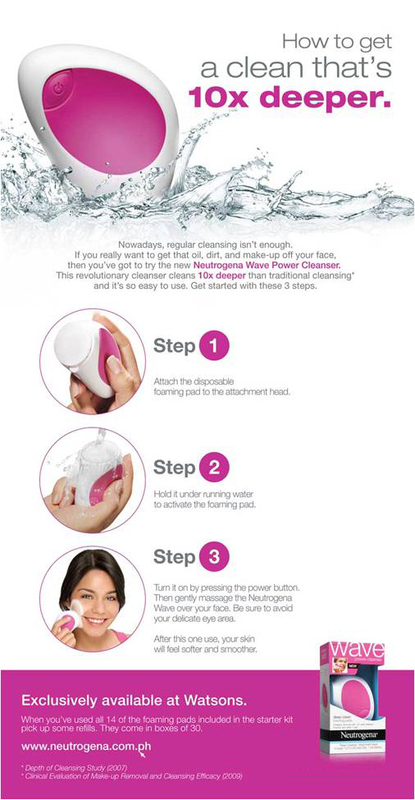 Turn on the Neutrogena Deep Clean Wave and gently massage the face avoiding the eye area. The softly textured pads of the Neutrogena Deep Clean Wave sweep away dead skin cells to achieve immediate results after just one use.